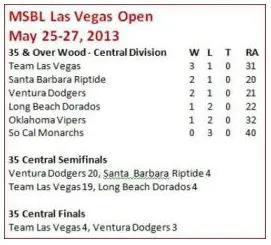 Eric Vargas blasted a walk-off, RBI double to score Malik Smith and give Team Las Vegas Blue a 4-3 win over the Ventura Dodgers and the 35 Central Las Vegas Open title. Scott McIntosh earned the win in relief of starter Mike Maganza. Thompson and manager Jason Warren were both 3-for-4 in a losing effort for Ventura.